And why does a world without lying seem to equal a world without compassion or emotions? It’s like a planet of Forrest Gumps, though without his strong moral code. People just look out for themselves and do nothing to help others. What does that have to do with honesty? And why do they have to convince as so damned stupid? Does incessant truthfulness kill one’s IQ? The Invention of Lying appears in an aspect ratio of approximately 1.85:1 on this single-sided, double-layered DVD; the image has been enhanced for 16X9 televisions. While the picture had some positives, it was more erratic than I’d like. Sharpness was inconsistent. Close-ups and two-shots looked fine, but anything wider tended to be rough and ill-defined. Some of the issues stemmed from digital artifacts; I noticed mild edge enhancement along with somewhat prominent mosquito noise. The movie came across as rather blocky on occasion, and I noticed shimmering and jagged edges at times. No source flaws appeared, however. Colors were decent. The movie went with a fairly subdued palette, so the hues never had much room to provide bright tones. Still, they looked fine within those restrictions. Blacks were reasonably dark and tight, while shadows showed good delineation. I liked enough of the transfer to merit a “C”, but some parts of it didn’t work very well. As for the film’s Dolby Digital 5.1 soundtrack, it was more consistent, but that wasn’t necessarily a positive. Like most comedies, this one went with a pretty restrained soundfield. Expect general ambience across the board. The surrounds offered moderate reinforcement and not much more. The scene in which Mark invents lying offered the only really impressive use of the spectrum; otherwise, this was a decidedly forgettable soundfield. The DVD includes a moderate allotment of extras. 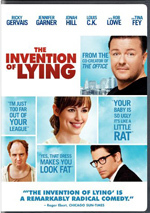 Prequel: The Dawn of Lying goes for six minutes, 29 seconds and provides Gervais and other members of the movie’s cast as cavemen. Gervais’s prehistoric ancestor tells the first lie. That’s not an especially exceptional conceit, and “Dawn” doesn’t make it very interesting. Though not described as such, this is actually a deleted scene originally intended as a pre-credit sequence. Since the final flick’s already pretty tedious, I’m glad it didn’t make the cut. A few ads launch the disc. We get promos for Sherlock Holmes, The Time Traveler’s Wife, The Blind Side and Preacher’s Kid. No trailer for Lying appears here. Despite a clever premise and a whole lot of talent both behind and in front of the camera, The Invention of Lying flops. It uses up most of its laugh lines in its first 10 minutes, and it proves tedious as it rehashes the same gags again and again. The DVD provides average picture, audio and extras. I can’t even recommend Lying to Ricky Gervais fans, as I expect they’ll see it as a big disappointment.